If you’re ready to grow gorgeous, healthy plants in the comfort of your backyard, we’re ready to help you select the ideal greenhouse to do it. We take the time to work with every customer individually, helping them select the perfect greenhouse for their unique home environment and growing needs. We’re proud to offer a variety of greenhouse types and sizes to suit just about any home gardening situation, and we encourage you to refer to the table below for more information on our pricing and sizes. If you’d like to learn more about our greenhouses or start discussing your own gardening goals, we encourage you to give us a call today at 800.544.5276. Or, if you’d like to browse our products in more detail, just request your own free catalog. We can’t wait to hear from you, and we’re looking forward to helping you grow beautiful plants in the comfort of your own backyard! At SB Greenhouses, we believe everyone deserves the unique pleasure of growing bountiful, beautiful crops right in the comfort of their own home. That’s why we’re committed to making the highest-quality DIY greenhouse kits for home gardeners of every level, and why we work with every customer to help them select the perfect greenhouse for their unique needs and situation. We’re proud to create beautiful, efficient, and highly effective greenhouses for gardeners all over the country, and our standard greenhouse kit is the perfect place to start. We’re proud to offer build-your-own greenhouse kits in a wide variety of shapes, sizes, and materials, and it all starts with our standard greenhouse kits. But while we may call them standard kits, the reality is that they’re anything but standard! 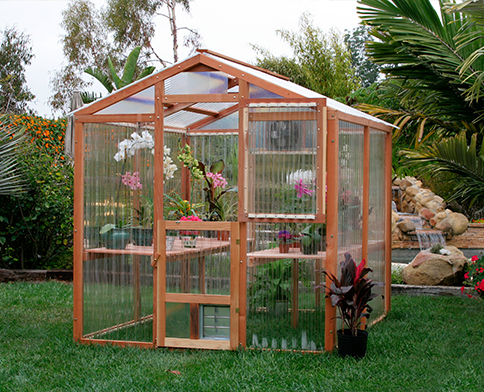 Each of our standard greenhouse kits uses only the finest California redwood and 6mm twin-wall polycarbonate coverings for unmatched durability, weather resistance, and light transmission of 95%. Our polycarbonate coverings allow in all the light plants need to grow while screening out harmful waves like ultraviolet rays. This means that plants grown in our greenhouses are happier, healthier, and more plentiful. You can count on plants to grow better in a Santa Barbara Greenhouse. Over the years, we’ve found that vertical walls are simply the best for home gardener greenhouses. Our vertical wall design provides up to 30% more growing space than sloped side or dome-shaped designs, letting you grow more beautiful plants in the same footprint. Plus, all of our parts are pre-cut and pre-drilled in our USA factory, ensuring that assembly is as easy as possible for you. You’ll be growing beautiful plants in your own backyard in no time – and we’re always here if you have questions to help you build the best backyard greenhouse for your home.